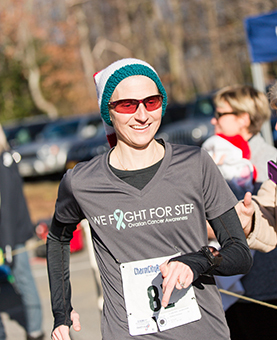 Please join Stef Ripple on December 2nd as we participate in the 2017 DeCesaris Prout Cancer Foundation Jingle Bell Run/Walk in memory of Stef! This race was one of Stef’s favorites and one that she ran prior to and during her ovarian cancer diagnosis. It’s an honor to her family that this years race is in memory of her! This event is designed to raise awareness for lung and ovarian cancer and to raise funds to support various educational research programs. Stef Ripple has formed a team and will be at the event. Please join us! Register for the Stef Ripple Team – Use Code STEFRIPPLE for $5 off! For more information about the event, please visit the DeCesaris Prout Cancer Foundation website.